Invoke-WebRequest : The response content cannot be parsed because the Internet Explorer engine is not available, or Internet Explorer’s first-launch configuration is not complete. Specify the UseBasicParsing parameter and try again. 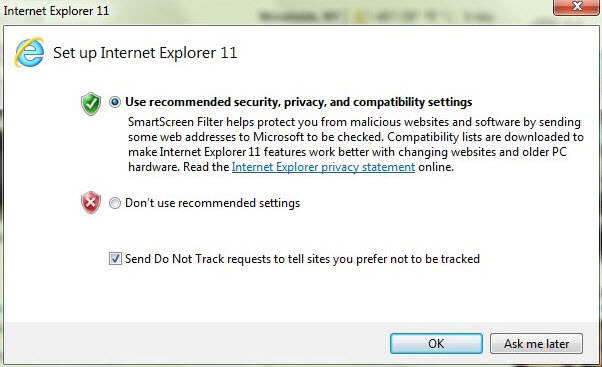 For this service account, the error was correct – I had never logged in and run Internet Explorer. As a reminder, the first launch screen is the one asking you about Internet Explorer settings for security, privacy, and compatibility. I essentially ignored the advice to set the UseBasicParsing parameter, because in many cases that isn’t an option and it would be silly to edit all of my cmdlets just for this. Having to walk through this set up screen on every computer that may ever need to run a service account would be crazy. Automation is clearly the answer. I’ve opted to use a Group Policy Object (GPO) to handle the first run wizard. 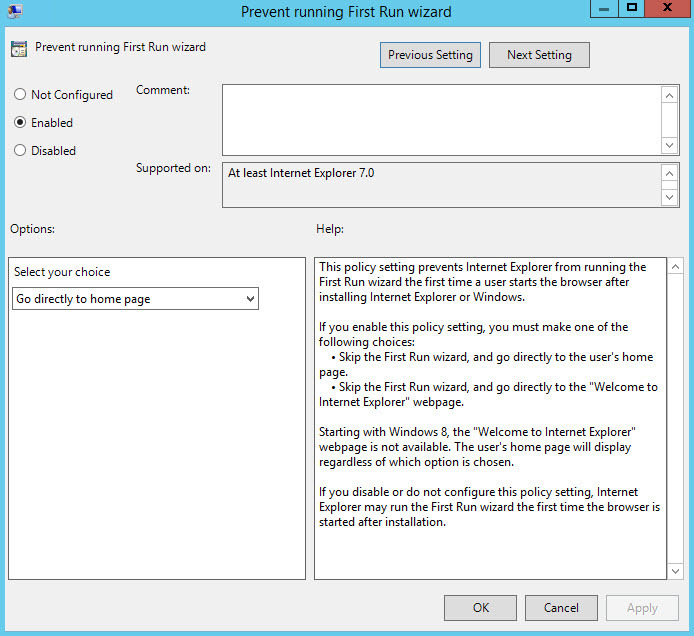 I’ve included a screenshot of the GPO setting below – it’s in Computer Configuration > Policies > Administrative Templates > Windows Components > Internet Explorer. Set the policy to Enabled and pick an option that suits you (I chose to go to the home page). 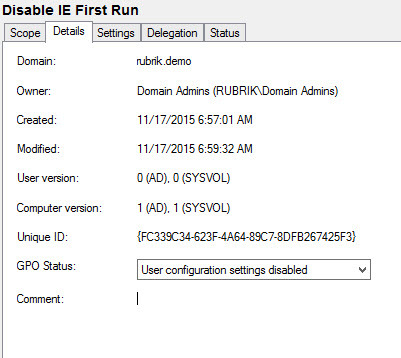 Practice proper GPO creation by toggling the GPO Status to User configuration settings disabled. This is because there are no user configuration settings specified in this GPO. Properly setting the GPO Status will have a positive impact on your GPO update run times. The Connect-Rubrik cmdlet fails with the first run error. I trigger a group policy update using the command prompt. A second attempt at the Connect-Rubrik cmdlet with Internet Explorer’s First Run having been disabled. Success! I hope this helps anyone else looking to use the Task Scheduler to run PowerShell cmdlets that invoke a RESTful API. You saved my day! Thanks, works perfectly! Instead of “Prevent RUNNING First Run wizard”. Really weird part is that when exported with GPResult on the target machines (also 2008-R2) it used the name provided in the article: “Prevent running First Run wizard”. You made my day! I was wrestling with this issue for hours on Friday. I noticed my PS Script that invokes a REST API endpoint worked fine under my creds on the DEV Server, but kept failing with this error when I rant it as the Service Account user. Turns out that this wizard was the problem, and the script was running fine under my user since I had remoted into it and opened up IE and selected the wizard setting, but didn’t do so with the service user. Although a simple one, it helped me a lot.. thank you very much.